The year was 1999, and the world was in desperate need of singing fishes. It had been 25 years since Al Green’s Take Me to the River had graced the airwaves and the last place anyone would’ve expected to hear those smooth tunes was out of the mouth of an animatronic bass underneath the tree on Christmas morning. It was like a match made in heaven, and thus the infamous Big Mouth Billy Bass was born! They say that all good things fade away with time, but this was one fish that wasn’t quite ready to retire just yet. 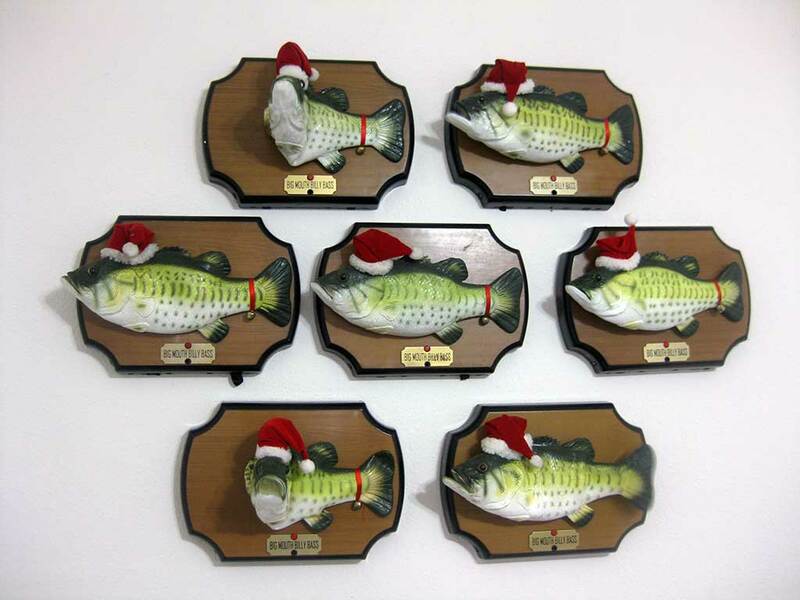 These days you may not be able to find Big Mouth Billy Bass on the shelves of your favorite shopping establishment, but you can most certainly find him on the digital shelves of eBay – a feat that I recently confirmed by procuring no less than one dozen of these caroling crappies in order to spread a scaly bit of holiday joy throughout my extended family to ensure that each and every one of them found themselves with a happy, holiday fish to unwrap on Christmas morning. As you might expect, the sight of so many singing bass – all dressed up in their holiday best – was perhaps the most magical thing I’d ever seen in my life, but of course before I could wrap and box each of them up to go their separate ways to Christmases in the far corners of the globe, it was only fair that I first allow the Billys Bass to do that which they do best. As they also say, you don’t gather the choir without giving everyone a chance to SING!!! There are just some things that would take too much eggnog to explain. …but at least it was amusing! Because seriously, how often is it that one gets so many singing fish all schooled together in one place, anyways – especially during the busy holiday season?! By the end of our brief, bass-tastical Christmas performance that featured a bizarre mash-up of Jingle Bells and Up On the Housetop and ‘Twas the Night Before Christmas all at the same time, I knew that it was time to say goodbye and send my newfound fishy friends upon their merry way, for there were a lot of miles for them all to cover – courtesy of the US Postal Service – and on top of that, my wife was going to be home any minute!